General Hospital (GH) spoilers tease that Carly (Laura Wright) will get on current Jason’s (Billy Miller) last nerve. He’s not exactly a fan of Sonny (Maurice Benard) right now either. BM Jason’s sick and tired of watching them care for their new pet, Patient Six (Steve Burton). They tossed their old pal aside the moment classic Jason showed up. Regardless of the twin drama outcome, that was pretty cold. GH viewers can expect Jason’s anger to grow stronger. More people are turning against him, so he’ll undoubtedly have those betrayals on his mind. General Hospital spoilers say Jason will once again make his position clear. He’s convinced that he’s Jason Morgan and he doesn’t want the doubters to get in his way. However, Carly will run her mouth as usual. Her smug attitude can get old sometimes, but maybe we should cut her a little slack this time around. Carly feels guilty for giving classic Jason’s life to someone else. She’s scrambling to fix it and that’s understandable. Still, Carly’s not doing a very good job of considering Jason’s feelings. She’ll continue to throw 100 percent of her support at Patient Six, so Jason’s rage will bubble up. 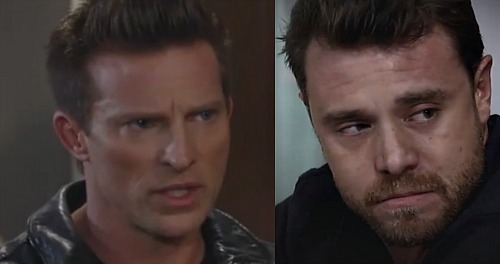 General Hospital spoilers say current Jason will finally snap. He’ll have a major outburst and indicate in no uncertain terms that HE. IS. JASON. MORGAN. He’ll roar about all the disloyalty and insist that everyone’s wrong. Unfortunately, it seems current Jason will reach his breaking point at the worst possible time. This emotional explosion will take place on November 30 and a crushing blow will hit the next day. General Hospital spoilers say current Jason will struggle to believe news he receives. He’ll be in shock as he tries to wrap his head around the updates. It sounds like Jason will learn he isn’t Jason after all. GH may have some twists in store down the road, but it appears this is how they’ll present the info at first. Jason will likely learn he’s Andrew and begin the difficult process of accepting it. He’ll have to eat some serious crow after all that smack talk! Do you feel sorry for current Jason after everything he’s been through? Will there be a reversal that changes the game later? We’ll keep you posted as other General Hospital details emerge. Stick with ABC’s GH and don’t forget to check CDL often for the latest General Hospital spoilers, updates and news.